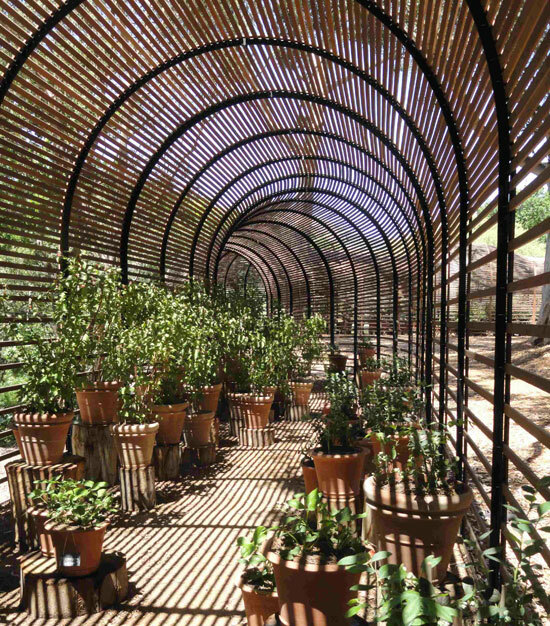 If you visited Babylonstoren since our Clivia Month in September, you’ll most likely have taken a walk through the ‘Puff Adder” – the meandering shade house that snakes through the trees by the river. The clivias have finished flowering now, so we’ve moved our raspberry, blueberry, blackberry & strawberry plants into the Puff Adder. We have a range of varieties that are suitable for the home gardener, such the Autumn Bliss raspberry, the Duke & Birgitte blueberry, and a blackberry known as Young & Arapoho, all growing in pots in the shaded walk. We’re enjoying watching them develop from flower to ripening fruit, and have had unexpected surprises, like the sweet scent from the white flower bells of the Blueberry Duke (below, right).